The 30-year fixed mortgage rate is at 3.93 percent, down three points from last week. The 15-year fixed mortgage rate is at 3.05 percent. The rate for a 5/1 adjustable-rate mortgage is 2.93 percent. Privately owned housing starts in May 2015 were at a seasonally adjusted annual rate of 1.036 million units. That’s 11.1 percent below the revised April estimate of 1.165 million units, but 5.1 percent above the May 2014 rate of 986,000 units. Privately owned housing units authorized by building permits in May were at a seasonally adjusted annual rate of nearly 1.3 million units, or 11.8 percent above the revised April rate of 1.14 million units, and 25.4 percent above the May 2014 rate of 1.017 million units. Privately owned housing completions in May were at a seasonally adjusted annual rate of 1.034 million units, or 4.7 percent above the revised April estimate of 988,000 units, and 14.5 percent above the May 2014 rate of 903,000 units. Single-family housing starts in May were at a rate of 680,000 units, or 5.4 percent below the revised April figure of 719,000 units. Single-family housing completions in May were at a rate of 635,000 units, or 5.2 percent below the revised April rate of 670,000 units. About 90 percent of mortgaged residential properties (44.9 million) have equity. 10.2 percent of mortgaged homes (5.1 million) are underwater or have negative equity. 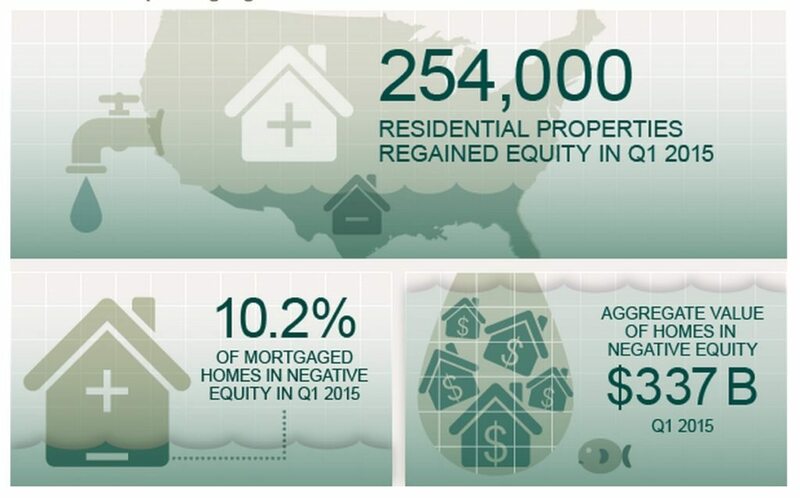 Overall borrower equity increased year over year by $694 billion in the first quarter of 2015, with 254,000 properties regaining equity. 19.4 percent of borrowers with equity have less than 20 percent equity, and 2.7 percent have less than 5 percent. 94 percent of homes valued at more than $200,000 have equity, compared with 85 percent of homes valued at less than $200,000.